E. Dake Plumbing & Heating is proud to serve the Ashtabula community! About Ashtabula, OH - Happy to be your hometown Heating & Air Conditioning Contractor! The city of Ashtabula, Ohio was founded in 1803 at the turn of the 19th century. Located in the most Northeastern county of Ohio, the city hosts beautiful scenery, classic architecture, and pleasant weather, which makes Ashtabula a desirable destination for both visitors and potential residents. Ashtabula boasts several unique characteristics because of its rich history and distinctive location. 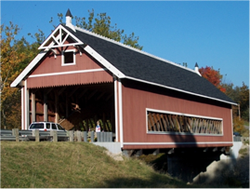 Not only is Ashtabula home to 18 covered bridges, an iconic symbol of 19th century America, they also have the longest and shortest on record in the United States. Standing at 613 feet, the Smolen Gulf Covered Bridge allows travelers to cross the Ashtabola River, while the West Liberty Street Covered Bridge spans an 18 foot gap across Cowles Creek. Also unique to this region of Ohio are luscious vineyards. The Ferrante Winery and Ristorante, the Markko Vineyard, and the Grand River Cellars Winery and Restaurant, among many others, are available for tours and tastings throughout the mild springs and summers. Culture and history is alive in Ashtabula where you can visit up to 19 museums. Once a prominent stop on the Underground Railroad, Ashtabula honors its history with multiple memorials and historical centers; notably the Hubbard House Underground Railroad Museum. Other attractions for visitors include the Ashtabula Maritime Museum, which has artifacts and information about the city’s light houses and former maritime trade, and the Greenway Trail which offers people a chance to explore nature and get some fresh air on 20 miles of trail in the beautiful Ohio weather.